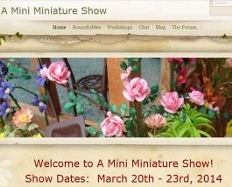 I have been participating in the online miniature show “A Mini Miniature Show” and have been having such a wonderful time. This is the first time I have ever done it and have made many friends along with, might I add, sales. I decided that I should offer really good prices on most of my items as I have had them for such a long time and I feel it is a good time to clear out, see what sells, share the minis and most of all see what I might want to make again and perhaps improve upon it. I have posted all of the items offered at the show onto my Online Store here and marked them as sold if they sold or leave them for sale here when the show ends. Some items I will be taking orders and will entertain the idea of customizing if able to. I have had the pleasure of making friends with people as far away as Australia during the process of the purchase and I look forward to a continued friendship with these people, some of whom have shared just how they are going to use the items purchased. It’s been fun…now I have to deal with the packing and shipping….Thank you Shelly for this great venue!